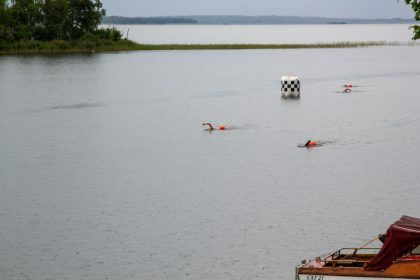 This year’s summer holiday incorporated a plan to swim the length of Lake Vidöstern in Southern Sweden by competing in the Vidösternsimmet, billed as Sweden's longest and toughest open water swim race. Officially the race is 21.5km but there are also 6km and a 500m options. It was a tough swim but certainly one of the friendliest and most well-organised events I've ever been to. We’d booked a stuga ‘camping cabin’ at Värnamo Camping. The cabin included four beds, a fridge and a table and chairs. Like most campsites in Sweden Värnamo Camping had excellent facilities including the ubiquitous mini golf 'crazy golf’ course. Crazy golf seems to be a national preoccupation. Perhaps one of the reasons why Sweden always scores so highly on the various happiness scales that appear from time to time? It's not just the beautiful countryside, the fantastic public facilities or even the socially conscious and family-friendly policies that make life in Sweden so bearable. It's likely that your average smiling Swede will be content having just had their fika ‘coffee break’ with a kanelbulle ‘cinnamon bun’ and got in a couple of rounds of mini golf ‘crazy golf’. 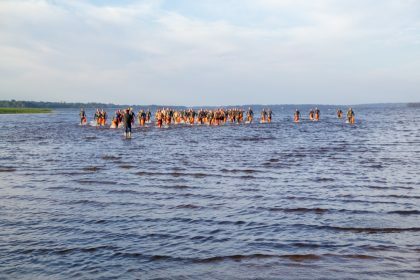 The race starts from a beach on the northern shore of Lake Vidöstern. 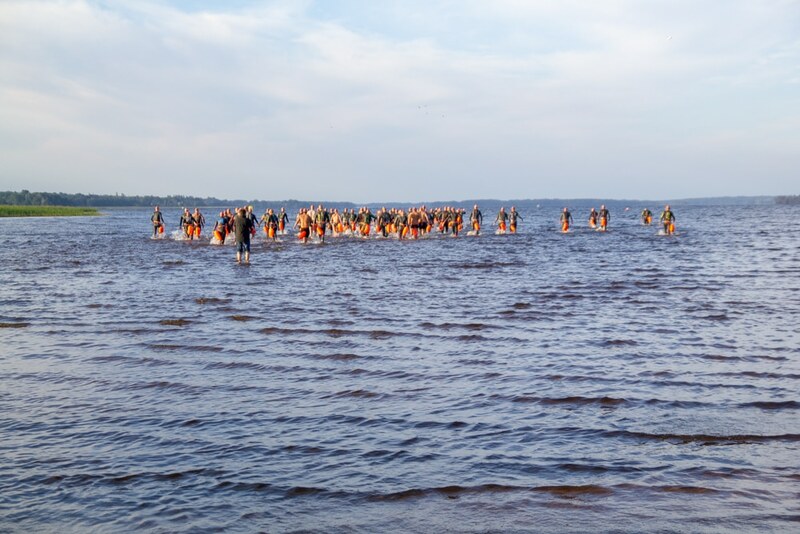 Like most swims, the race format is pretty straightforward... You get in and swim as swiftly as you see fit to the finish line where you must remember to get out. 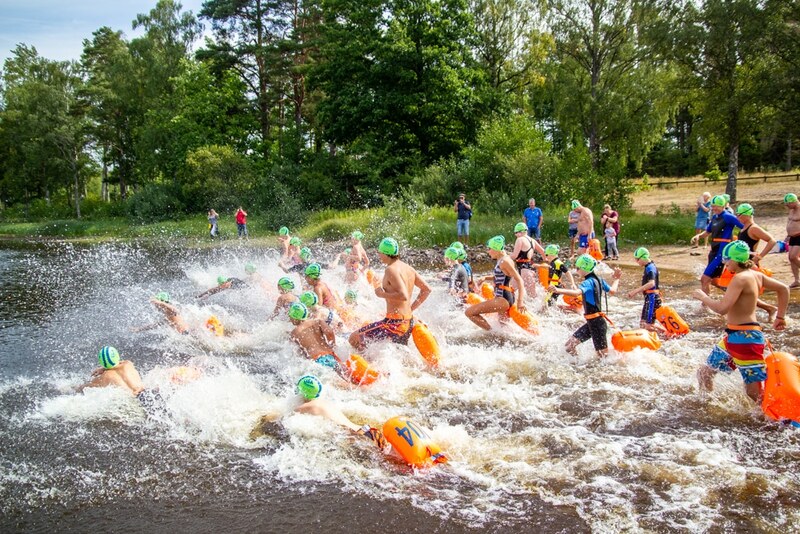 The more serious racers should also remember to swim slightly faster than their fellow competitors. You'll be motivated throughout the swim by thoughts of food and finishing. If you're Swedish this will probably involve concentrating on cinnamon buns and the chance of a round of crazy golf after the hot tub. 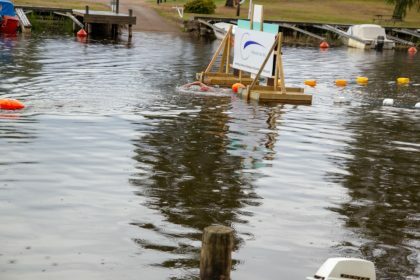 Of course, you can't swim 21km without nourishment, so the race organisers thoughtfully placed five feeding stations along the way. 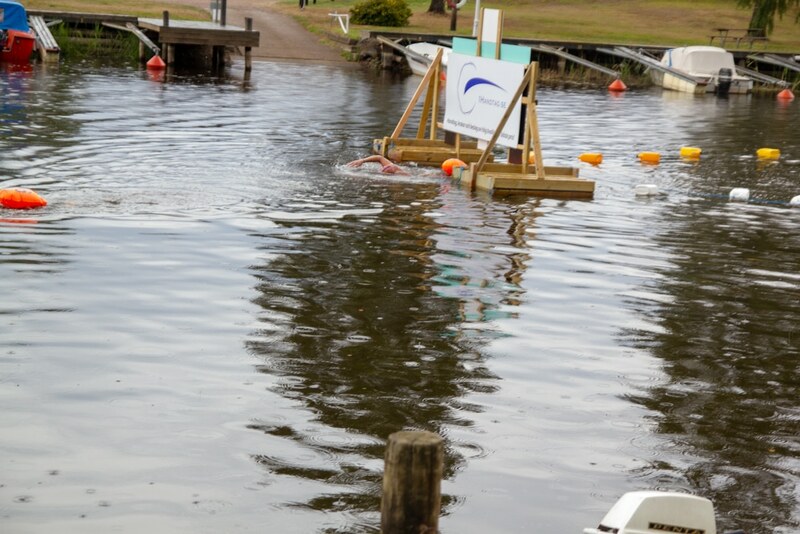 The first and last stations were pontoons so swimmers stayed in the water and were offered energy drinks and gels. At the other stations, swimmers came ashore and were met with a veritable smörgåsbord of delights. The appearance of mini cinnamon buns didn't disappoint either! 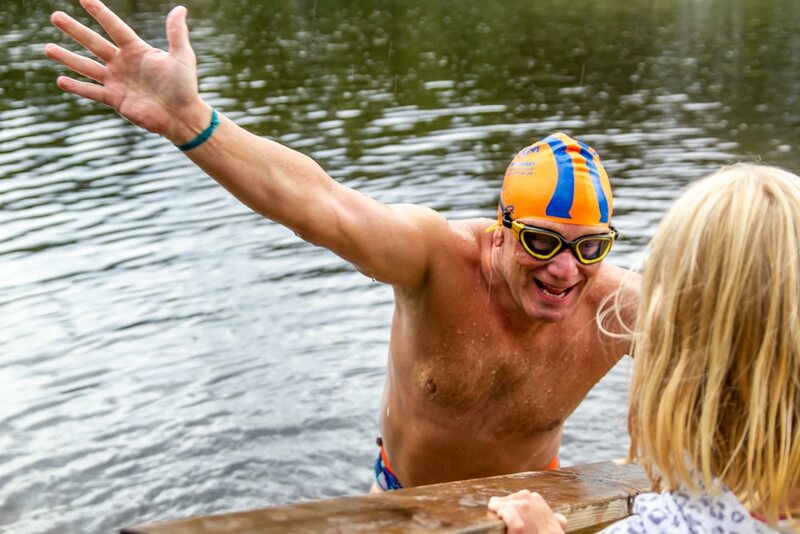 My training had been pretty good having completed quite a few sea swims in excess of 20km as well as several long freshwater swims in the weeks leading up to the Vidösternsimmet. I was expecting this lake swim to be tough and it certainly was. A swimmer is noticeably less buoyant in freshwater which makes it harder work especially if you choose to swim without a wetsuit. I started the race well enough, ensuring that I soon settled into a steady stroke. 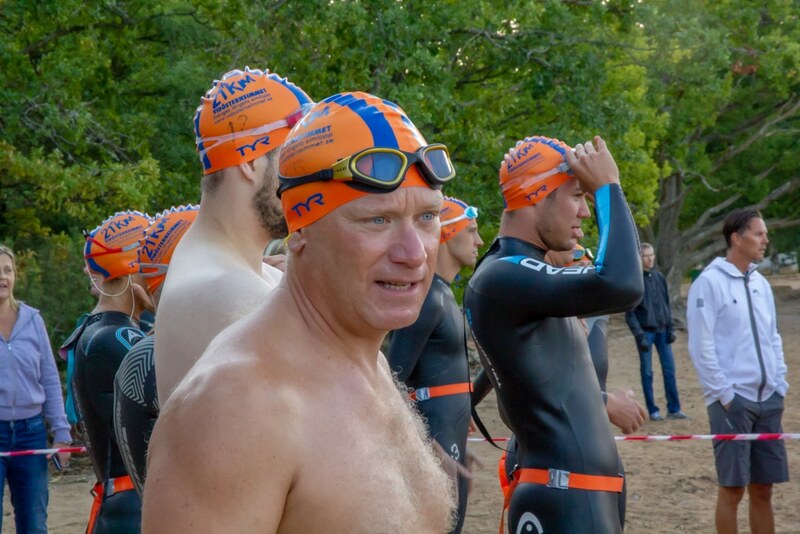 The key to a long-distance swim is to start at a pace that you can maintain and to keep something in reserve for the final push to the finish - and so you don't look like a total ambulance case for the finishing photos! So things were going well for me up until third feed station at Tånnö. But I made an error here as I'd forgotten that there was a much longer distance after this station until the next one. I didn’t really take on enough food and had another 5.5km to swim. At this point, the weather worsened and a strong headwind developed. Waves soon formed which were hard to swim through and the increased effort soon began to deplete my energy levels. I began to start losing places as the more buoyant wetsuit swimmers passed me. This stage of the race was pretty demoralising if I'm honest and I just had to grit my teeth and concentrate on cinnamon buns and crazy golf to get me through it. Arriving at the fourth feeding station was a good feeling. By far my longest feed stop as the official race stats showed that I spent over five minutes stuffing myself with drinks, chocolates, bananas, pickled cucumbers (yes, really), flapjacks and of course cinnamon buns. I swam harder after this stop and even began to pick up a few places. The race course was marked out with big yellow buoys with consecutive numbers on them. I'd just passed number 19... Great, just 2km left to go (I wrongly assumed). 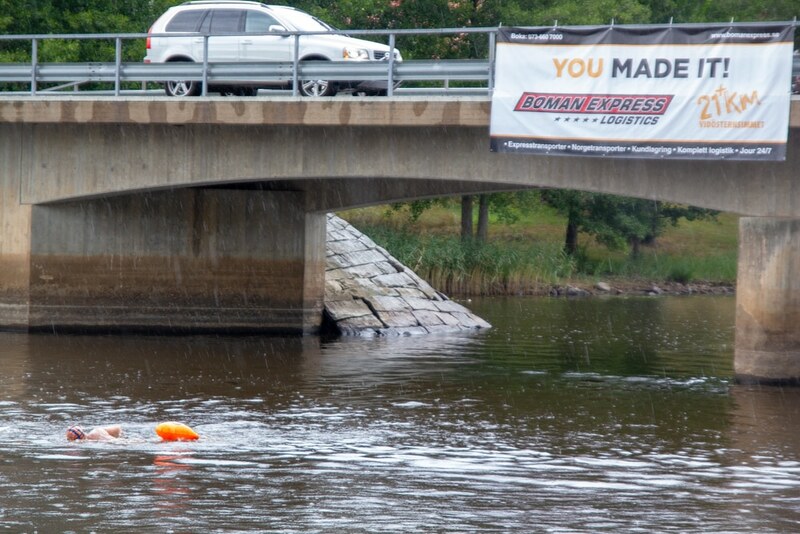 As it turns out there were actually 22 numbered buoys marking the 21km course. Damn! I’d started my push for the finish a little too early. Anyway, I came to terms with my error feeling that I probably deserved this minor misfortunate as it was some form of retribution from the Norse God of crazy golf. I just counted myself as lucky not to have been eaten by a troll. Finishing a long swim is usually a mix of emotions, a great sense of achievement and maybe a little relief. 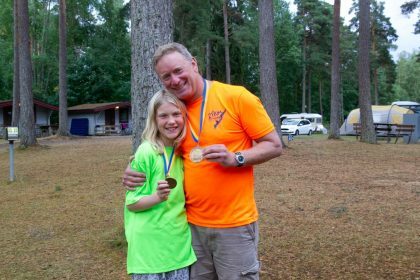 My finish was even better as I was met on the jetty my daughter, aged 10, wearing a beaming smile and a medal around her neck. She'd completed the 500m Lilla Vidösternsimmet - her first ever open water race! After the obligatory hot tub debriefing session, it was off to pick up my race t-shirt, coffee and waffle with jam, homemade lasagne and drink – all of which were included in the race entry. I just have to say a few words about the overall experience because the Vidösternsimmet is certainly one of the most friendly and well-organised events I've ever been to. In fact, the organisers seem to have thought of pretty much everything and I can’t really give much feedback on how things could be improved. There were pre-race briefings the night before in a hotel in English and Swedish where competitors had a chance to ask questions and meet others. Transport from various pickup points was on hand to get people to the start on the morning of the race. Spectators were well considered and were able to get to the feeding stations to lend support. The choice of food and drink at the feeding stations was fantastic. You could have chosen to bring your own swim feeds but there was really no need. There were adequate car parking and other facilities at the finish. Above all, the organisers and other volunteers were friendly, approachable and everything seemed to happen with an air of calm. Just no drama! Many of the Vidösternsimmet swimmers opted for local hotels and these seemed to be of good quality and reasonably priced. The Swim's website recommends the Hotel Tre Liljor in central Värnamo which has double rooms including breakfast for less than £100. We stayed at Värnamo Camping. Most campsites in Sweden have provision for caravans, campervans and tents but many also have cabins. The most basic of these included bunks beds, a fridge and a picnic table, with bed linen as an optional extra, although some cabins even had kitchenettes. You can expect to pay around £20 to pitch a tent and around £45 to £60 for a cabin or lodge which would sleep 4. 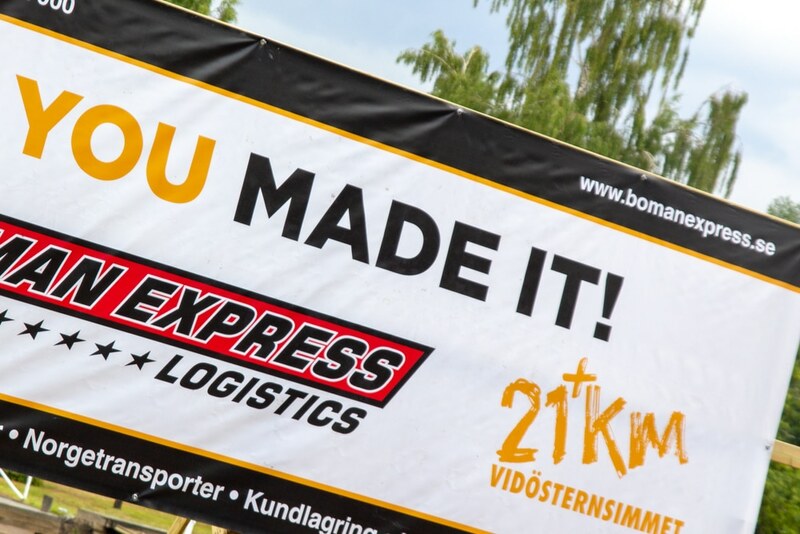 If you opt to camp most Swedish campsites have excellent facilities and you can reduce costs further by buying Camping Key Europe Card.